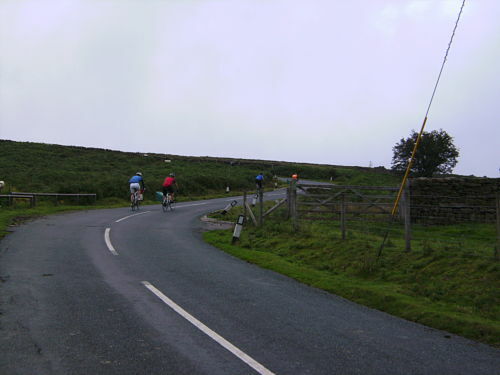 Having done the climb between Kildale and Commondale (probably) you will descend into Commondale Village. At the bottom of this descent on the right will be the Cleveland Inn, you may choose to pop in here for a pint or two rather than attempt the climb out of the village up onto the top of the moor at Three Howes Rigg. If you do I don’t blame you as you will have been looking at the severity of this climb for the previous five minutes or so as you approached the village (unless the mist has descended). It appears to be incredibly severe but it is not quite as bad as it looks, honest! The climb starts after the inn and looks like a wall. I think that the bottom is steeper than the 17% stated on the sign at the top of the hill but as long as you don’t go at it too hard it is manageable and the surface is good for a minor road. The climb is perhaps best broken down into three sections. The bottom section of the climb is steep and dead straight and it’s just a case of finding a gear you’re comfortable with and making your way up it. You will be starting to blow a bit as you reach the sharp right hand turn where the second section begins. From here it gets a bit easier as the gradient eases a little, perhaps to around 12 – 15%, the road then switchbacks to the left then right again. The worst is now over and you can see the top, the gradient is quite shallow in this final section but you will probably be quite tired and you will be glad that it’s over. As a descent this is quite an entertaining hill as you can swoop down through the switchbacks at the top (avoiding sheep as you go, definitely a 5 on the Sheep rating this climb!) before testing your nerve on the steep straight bottom section. There is a blind corner to the right at the pub though so you might want to slow down a bit rather than take an emergency detour through the bar! Probably not as bad as it looks from the view as you descend into the village, that said it is still tough though. We all felt that it was perhaps marginally easier than its twin the Kildale to Commondale climb about two miles down the road that we had been up just before . Dave felt that it was a good training hill if you wanted to get your foot down – now we know what he does in preparation for the club hill climb championships!